Employees can enter their own work time preferences (prefer and dislike work times), and you can also allow them to set their own “cannot work” times by changing that option on your SETTINGS>Employee Permissions page. 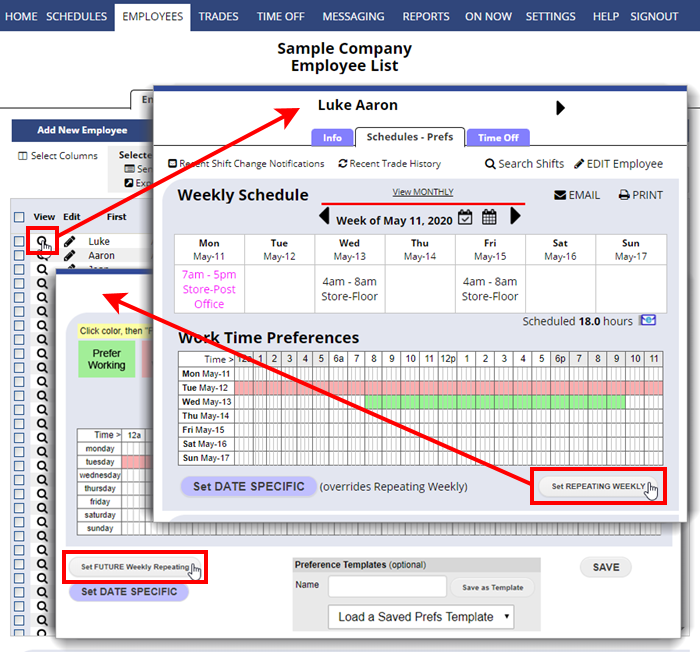 Managers can also enter the work time preferences and availability for employees by editing each employee record. Note: Work time preferences do not generate shifts, they can be used by AutoFill when you auto assign the shifts you have added or imported each week. Normally the Repeating Weekly preferences would be added first. Then if those will change on a certain date, from that same page you can set the FUTURE Repeating Weekly prefs. The Future Repeating Preferences go into effect on the specified date and will continue on until changed. 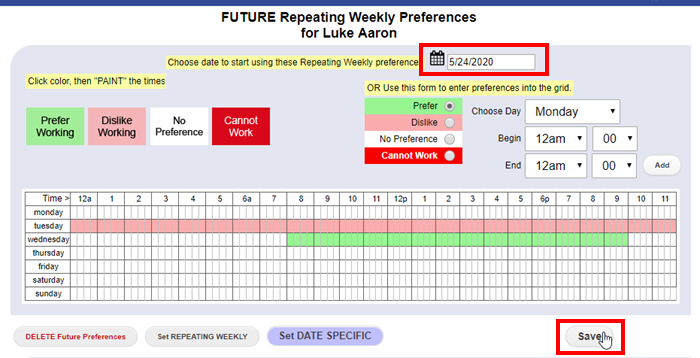 Once the date they go into effect has passed, you can enter a new set of Future Repeating Preferences that will begin on another future date. Note that “Date Specific Preferences” always override “Repeating Preferences.” So if it seems like your Preferences are not being taken into account when you save, then likely they are being overridden by Date Specific Preferences. In this case, the new set of Repeating Weekly Preferences will be go into effect on August 30. After that date, they will become the Repeating Weekly and the Future Repeating can be set for another future date.